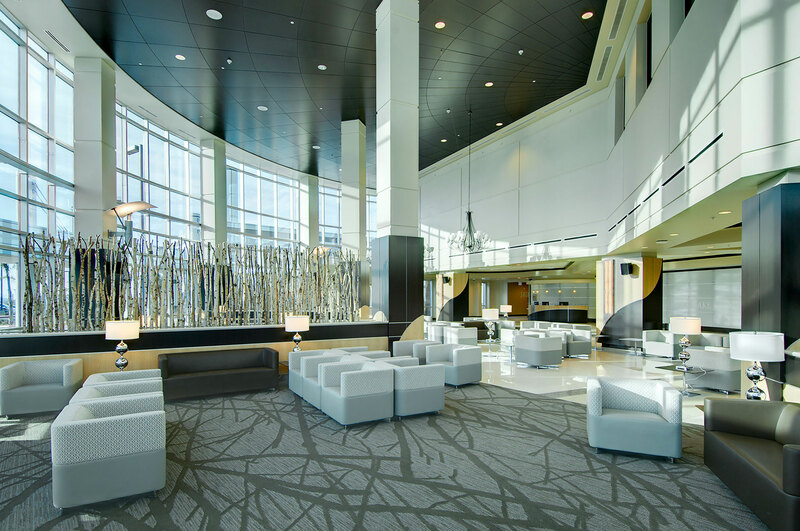 Nestled in Southern California’s beautiful Hogback Hills, Loma Linda University Medical Center welcomes patients with a bright white environment contrasted against a color palette of sky blues and dark faux wood that mimics the qualities of a luxury hotel. The color palette sets LLUMC apart. 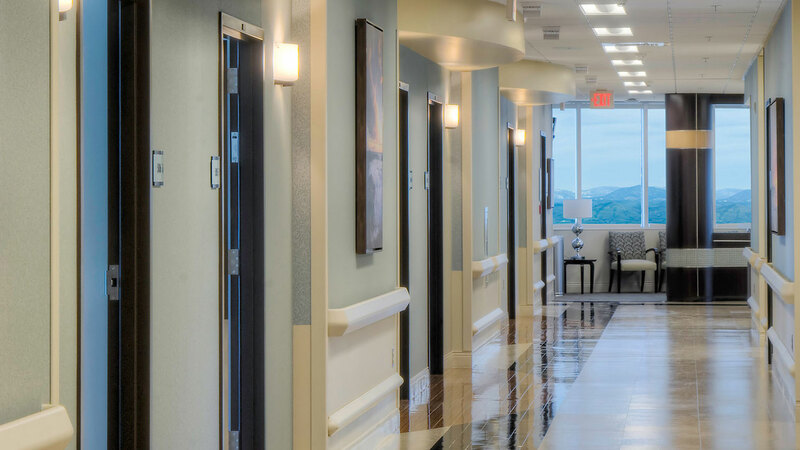 Extensive use of white is unusual in a healthcare facility because it more easily shows wear and soiling than darker colors. 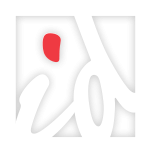 However, thanks to a commitment by hospital administration to a very high quality maintenance program, this unorthodox scheme works stunningly well. The unique Loma Linda experience begins in its two-story main lobby, which features a custom espresso veneered paneled ceiling, white walls and a multi-colored pattern terrazzo floor, accented with espresso vinyl sofas and offset by spa blue vinyl and fabric upholstered cube club chairs and customized lighting. 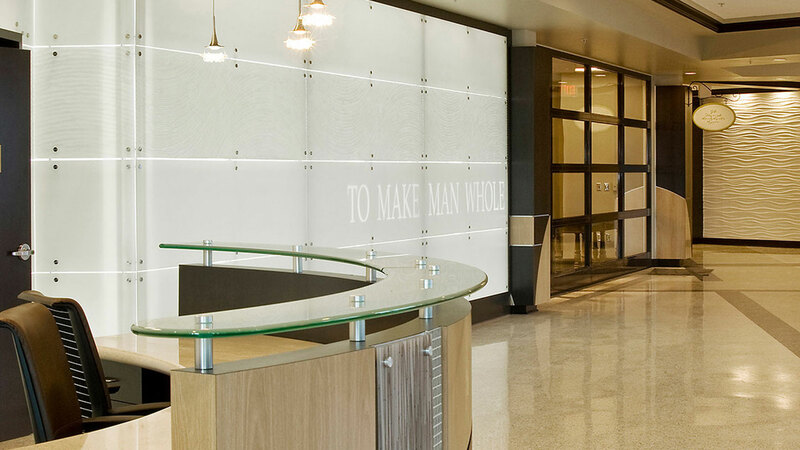 In addition, the main wall features a 46-foot glass-like (actually poly-resin by 3-form) installation with LED lights that illuminate the motto of Loma Linda University, “To Make Man Whole.” On one lobby accent wall designers reinvented the use of wavy lined drywall to mimic water, creating a uniquely calming result while also reducing the health hazards of using an actual waterscape that the client initially requested. Completing the lobby is a standup computer center for staff and guests with wireless Internet access, a lobby design first for Inner Design Studio. 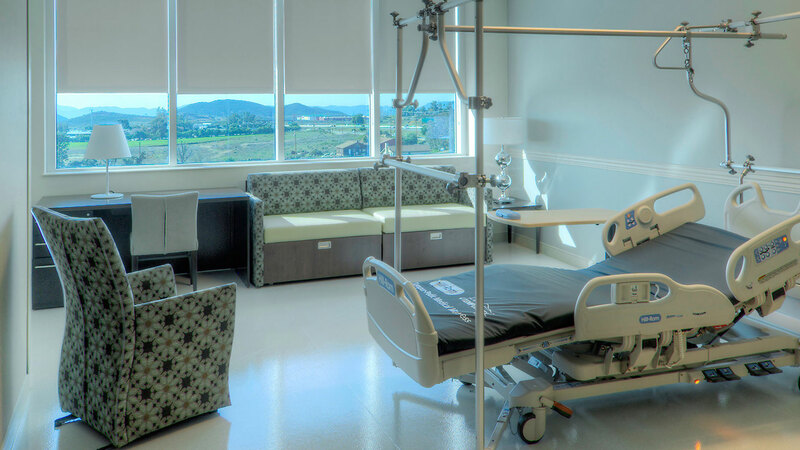 With no detail unturned, Loma Linda’s hospital rooms emanate the same contemporary, luxurious feel. 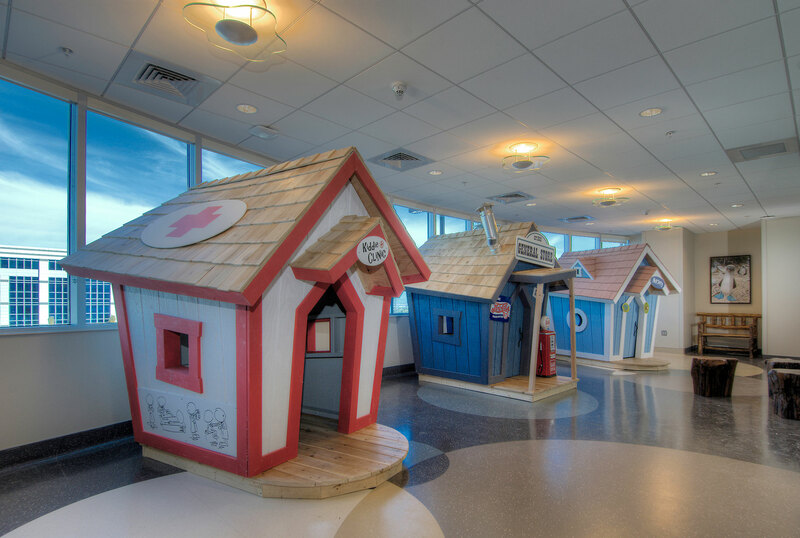 Each private hospital room continues the espresso laminate theme throughout the cabinets and doors and features customized Italian light fixtures, a translucent head wall built from 3-form, and custom-built patient information boards.